The Sunday Desert Crystal Masonry BBQ Grill would be the focal point any garden with it's stunning looks and Mediterranean vibe. The superb outdoor cooking facility features a reconstituted stone and marble fireplace and worktop, polished to give a clean and smooth crystal finish. As well as allowing for versatile outdoor cooking, this superb masonry grill serves 6- 8 people and will provide ambient heat from the open fire keeping your guests warm throughout the evening. Will open as a PDF in a new Window. All Sunday Barbecues are delivered in component parts which are delivered shrink-wrapped on a pallet ready for self-assembly. Ready-mix glue or mortar is required to build the BBQ and is used to assemble the components. This BBQ is supplied as unpainted and will require painting upon completion. (Paint not included but supplied as optional extra). Full assembly instructions are supplied and are easy to follow. Two people are required to build your the BBQ as some parts are heavy to lift into position. 24 hours after assembly, the barbecue needs painting with masonry paint (not included - optional extra). Keeping your barbecue in good condition is relatively easy. 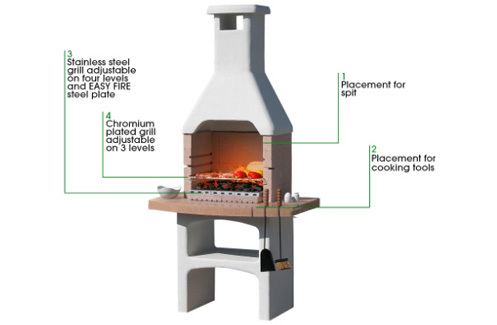 All barbecues are long lasting and durable and can be used all year around. However, it is advisable to cover your barbecue in cold or frosty periods with a cover or tarpaulin sheet. Click the button below to add the Sunday Desert Crystal Masonry BBQ to your wish list.